Monte Argentario is a beautiful peninsula in Southern Tuscany, in the area known as Maremma. It features a rugged coastline alternating cliffs and sandy bays, a dense Mediterranean vegetation inside and outside its protected nature reserves, and charming fishing villages dotted with ancient Spanish forts. One of these hamlets is Porto Santo Stefano: its colorful buildings are perched on different hills that overlook the town’s two harbors and, at a distance, Giglio Island, which can be reached with a 45-minute ferry ride. The colors of the sky at sunset, combined with the surrounding panorama, are simply breathtaking. At this time of year, the local population awaits with excitement for a historic event that dates back to 1937. 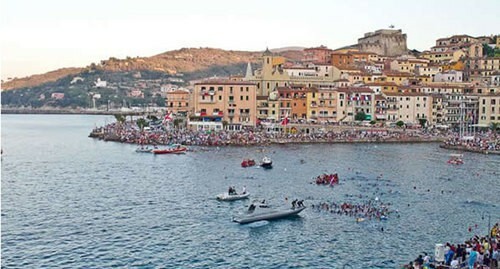 Every year, on the 15th of August, Porto Santo Stefano hosts the Palio Marinaro, a tough and passionate 4000-meter regatta. The date corresponds to an Italian national holiday, known as Ferragosto, which celebrates the Assumption of the Virgin Mary. The competition is between 4 four-oared small boats with coxswain, each proudly representing the town’s historic ‘rioni’ (or neighborhoods) of Croce, Fortezza, Pilarella and Valle. The locals cheer fervently throughout the event and throw themselves in the water to celebrate the winners at the end of the challenge. The origins of the Palio Marinaro are linked to an ancient maritime initiation festival, celebrated to prepare young people for the difficult life at sea. According to another version of its history, the regatta started as an evocation of the original inhabitants’ brave escape from Saracen pirates thanks to their seaworthiness. Every year, this solemn act renews the legendary pact between man and sea, emphasizing the characteristics of seafarers: faith, courage, strength and determination. 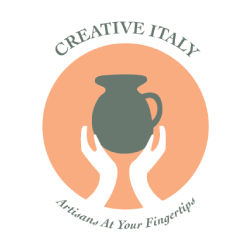 Definitely a must-see during your next vacation in Tuscany!